My final blog from our trip to Brazil, the wonderful town of Parati. Parati or Paraty, pronounced “Par-a-CHEE” is a preserved Portuguese colonial town located on the Costa Verde (Green Coast) coastline of the state of Rio de Janeiro, in Brazil. The town is located on the Bay of Ilha Grande, which is dotted with many tropical islands. Rising up as high as 1,300 meters behind the town are tropical forests, mountains, and waterfalls. Paraty was founded formally as a town by Portuguese colonizers in 1667, in a region populated by the Guaianás Indians. 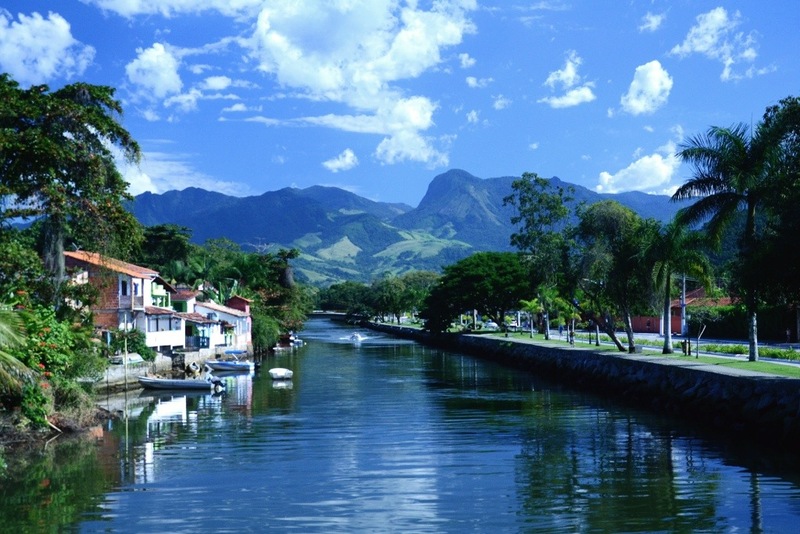 In the Tupi language “Paraty” means “river of fish”. When the region was colonized by the Portuguese, they adopted the Guaianás name for their new town. 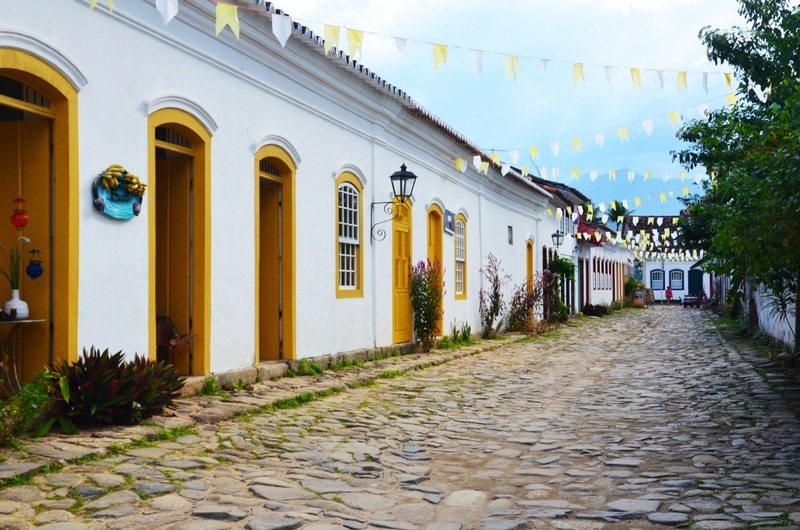 After the discovery of the world’s richest gold mines in 1696 in the mountains of Minas Gerais, Paraty became an export port for gold to Rio de Janeiro and from there on to Portugal. Eventually the gold began to run out and in the late 18th century, Paraty declined at a commercial port for gold. The city’s economic activity revived as a port for a new boom, Coffee in the early 19th century, until a railway along the valley created cheaper transport to the port of Rio de Janeiro. Another smaller revival came late in the 19th century with the production of cachaça, which is a sugarcane-derived spirit best known today as the basis for Brazil’s most famous drink, the caipirinha. 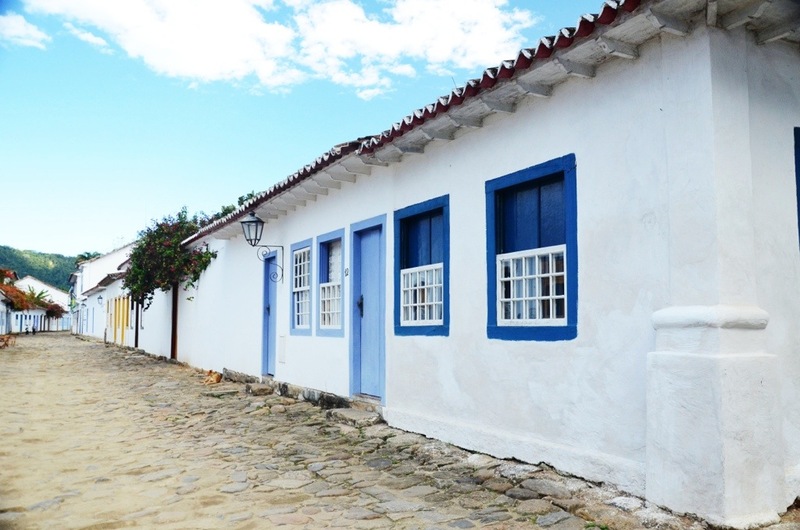 Since then, Paraty has been out of the mainstream, until a paved road was built from Rio de Janeiro to Santos in São Paulo state in the 1970’s. The city then began a new cycle of activity, which transformed a small, almost abandoned town living on very limited economic activity, mainly fishing and agriculture into a tourism destination. The South American coati, or ring-tailed coati (Nasua nasua), is a species of coati from tropical and subtropical South America. 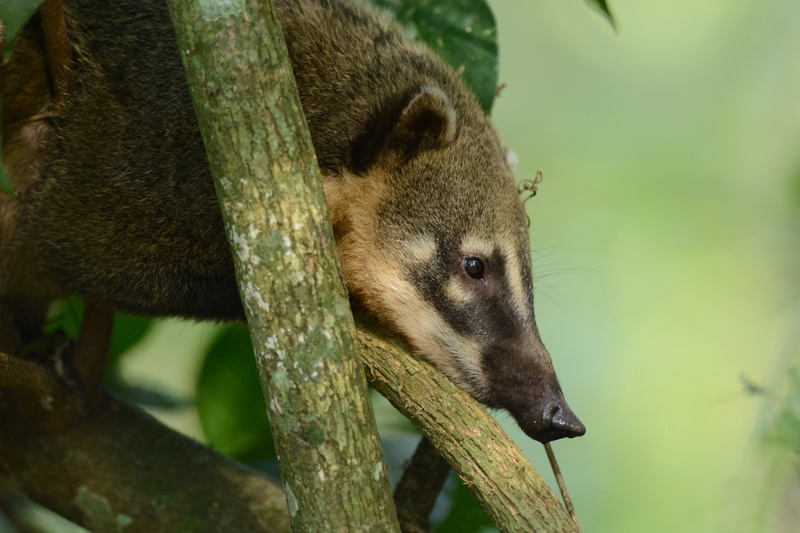 The South American coati is widespread and can be found from sea level to 3,000 metres from Colombia across to The Guianas and Northern Brazil and south down to Uruguay and northern Argentina. 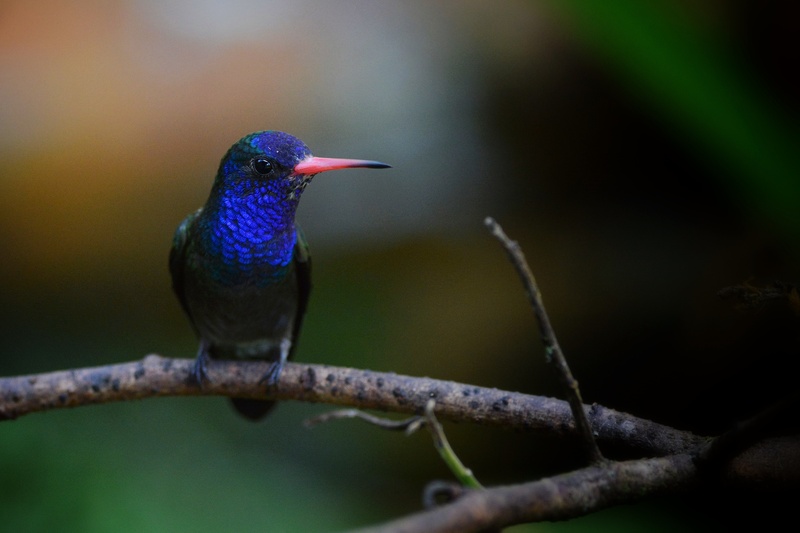 Chile is the only South American country where the species is not found! 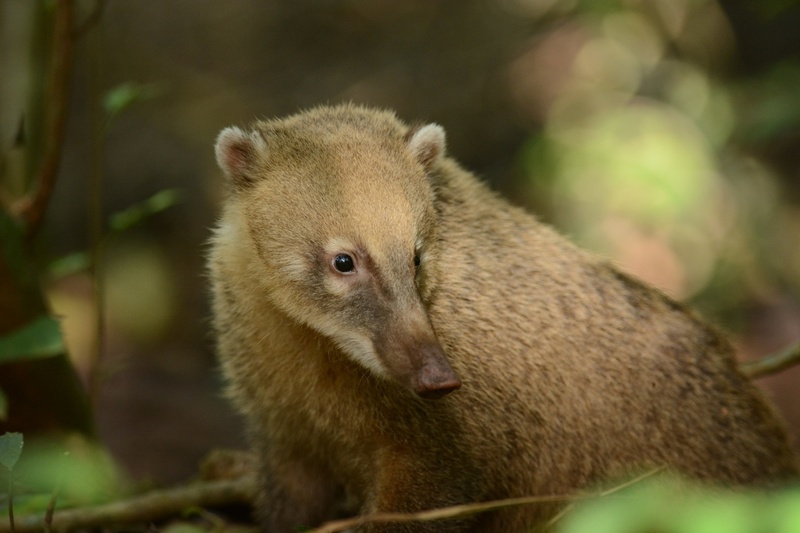 If visiting Parque Nacional do Iguaçu in Brazil or the Parque Nacional Iguazú in Argentina you will not fail to see the coati’s foraging in the forest or even on the walkways. Iguazu Falls, (Portuguese: Cataratas do Iguaçu; Spanish: Cataratas del Iguazú) are waterfalls of the Iguazu River at the border of the Brazilian and the Argentinian. The name “Iguazu” literaty translates from the Guarani or Tupi tribes meaning “big water”, and yes, as you can see from the photograph’s below, the water. 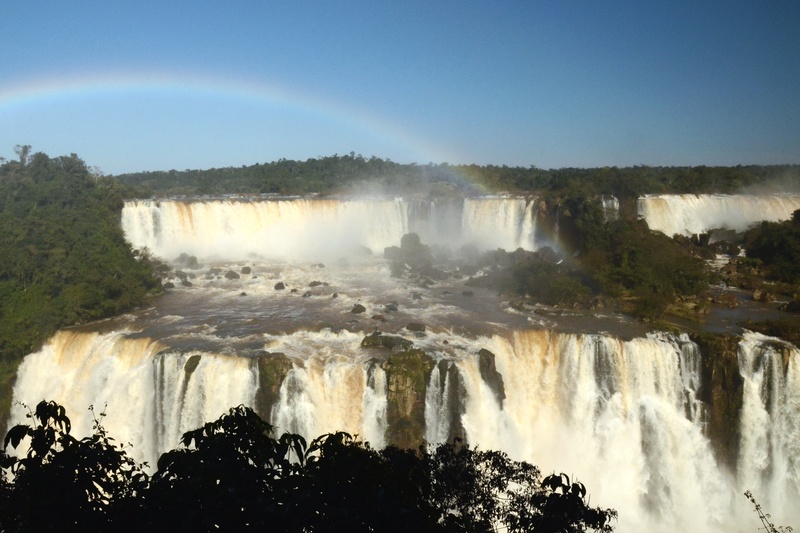 Iguazu Falls was announced as one of the seven winners of the New Seven Wonders of Nature by the New Seven Wonders of the World Foundation in late 2011. After visiting the falls, this is not a surprise. The falls are amazing on there own, but with comes the surrounding eco system. Depending on the time of year and the waterlevel, there is usually between 150 and 300 individual waterfalls, varying between 60 to 82 metres in height. About half of the river’s flow falls into a long and narrow chasm called the Devil’s Throat (Garganta del Diablo in Spanish or Garganta do Diabo in Portuguese). The Devil’s Throat is the highest of the waterfalls and at 82 metres high, 150 m wide, and 700 m long. 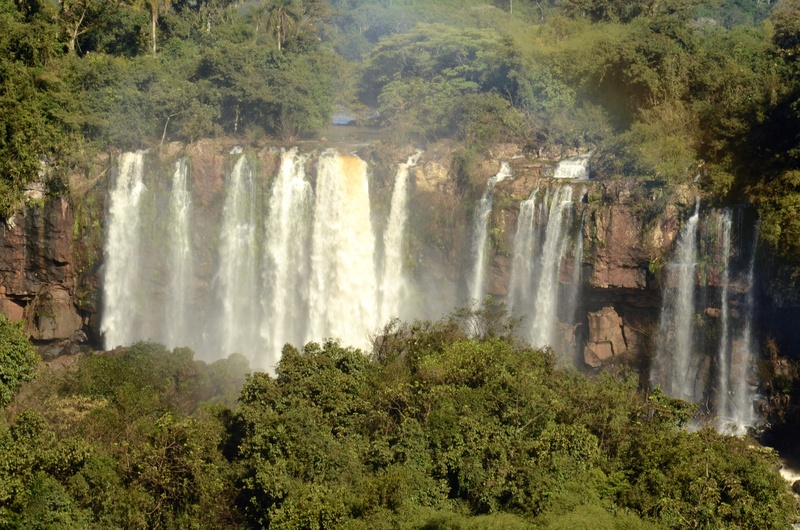 The falls can be reached from the two main towns on either side of the falls: Puerto Iguazú in Argentina and Foz do Iguaçu in Brazil, as well as from Ciudad del Este, Paraguay. The falls are shared by the Iguazú National Park (Argentina) and Iguaçu National Park (Brazil), and trust me the wildlife here is phenominal. Both national parks are designated UNESCO World Heritage Sites. On the Brazilian side, there is a walkway along the canyon with an extension to the lower base of the Devil’s Throat. The Argentine access, across the forest, is by a rainforest train. The train takes visitors to the entrance of Devil’s Throat, as well as the upper and lower trails around the falls, both of which are well worth a visit. So, made it to Brazil, and the first stop for a few days was deep in the Mata Atlântica. Not as famous as the Amazon or the Pantanal, the Atlantic Forest (Mata Atlântica) is a region of forest which extends along the Atlantic coast of Brazil from Rio Grande do Norte state in the north to Rio Grande do Sul state in the south, and inland as far as Paraguay and the Misiones Province of Argentina. The Atlantic Forest is characterised by a high species diversity and endemism. When conquered by the Portuguese the area of the Atlantic Forest was more than 1,000,000 km² (390,000 mi² Currently, the Atlantic Forest spans over 4,000 km² (1,500 mi²), a drastic reduction in just over 500 years! The Atlantic Forest is now designated a World Biosphere Reserve, which contains a large number of highly endangered species. The enormous biodiversity of the Atlantic Forest results in part from the wide range of latitude it covers, its variations in altitude, its diverse climatic regimes as well as the geological and climatic history of the whole region. Further, the Atlantic Forest is isolated from the neighbouring Amazon and the Andean forests. This isolation has resulted in an evolution of numerous endemic species, such as lion tamarins, woolly spider monkey, and marmosets, plus …… species of endemic birds. Despite so little forest remaining from the original 1,000,000 km² the Atlantic Forest remains extraordinarily lush, many of which are endangered. The official threatened species list of Brazil contains over 140 terrestrial mammal species found in Atlantic Forest. Nearly 250 species of amphibians, birds, and mammals have become extinct due to the result of human activity in the past 400-500 years. New species are continually being found in the Atlantic Forest, between 1990 and 2006 over a thousand new flowering plants were discovered, and in 1990 researchers re-discovered a small population of the black-faced lion tamarin, previously thought to have been extinct. A new species of blonde capuchin monkey was discovered in northeastern Brazil in 2006. 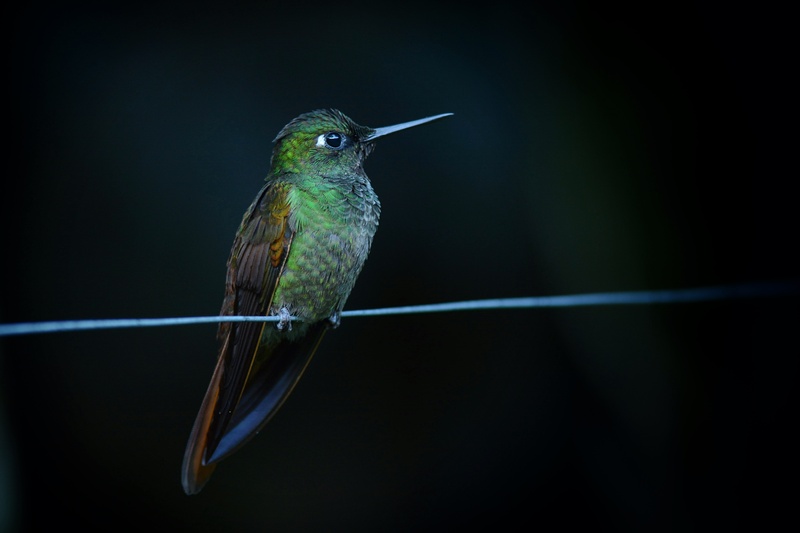 Unfortunately, the Atlantic Forest has been facing human-induced threats for decades. Around 70% of Brazil’s population live along the Atlantic coastline. The incorporation of modern human society continues to put pressure on the remaining forest, through agriculture and farming, hunting and trapping, logging and fire. Habitat fragmentation has led to a cascade of alterations of the original forest landscape. The endemic species in this region are especially vulnerable to extinction due to fragmentation because of their small geographic rages and low occurrence. Key ecological processes such as seed dispersal, gene flow and colonisation are disturbed by fragmentation. 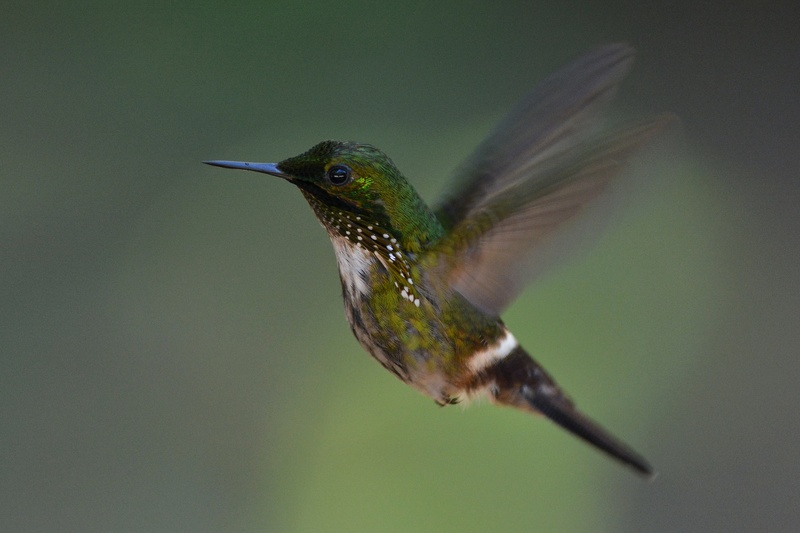 With many key vertebrate seed dispersers going extinct, it is predicted that many regional, fruit-bearing tree species in the Atlantic Forest will become extinct due to failure of seedling recruitment and recolonisation. 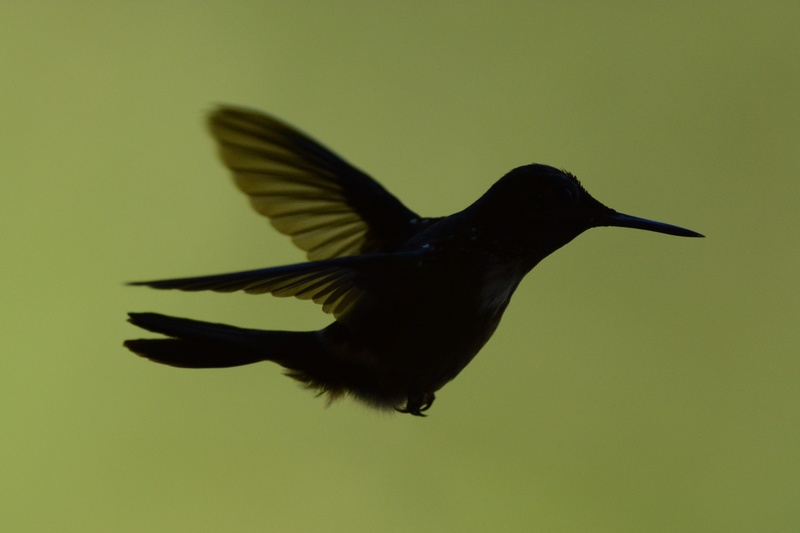 With so many species already threatened, it is predicted that with the persistence of current deforestation rates the Atlantic Forest will see continued extinction of species. The Tijuca Forest (Floresta da Tijuca in Portuguese) is a mountainous hand-planted rainforest in the city of Rio de Janeiro, Brazil. It is the world’s largest urban forest, covering some 32 km². The name Tijuca originates from an obscure term from Tupi language which means marsh, and is a reference to the Tijuca lagoon in the contemporary Barra da Tijuca. So the mountains were named Tijuca after the marsh? Try to work that one out! The Tijuca Forest is home to hundreds of species of plants and wildlife, many threatened by extinction, found only in the Mata Atlântica. After all the original forest had been destroyed to make way for coffee farms, Tijuca was replanted by Major Manuel Gomes Archer in the second half of the 19th century in a successful effort to protect Rio’s water supply. 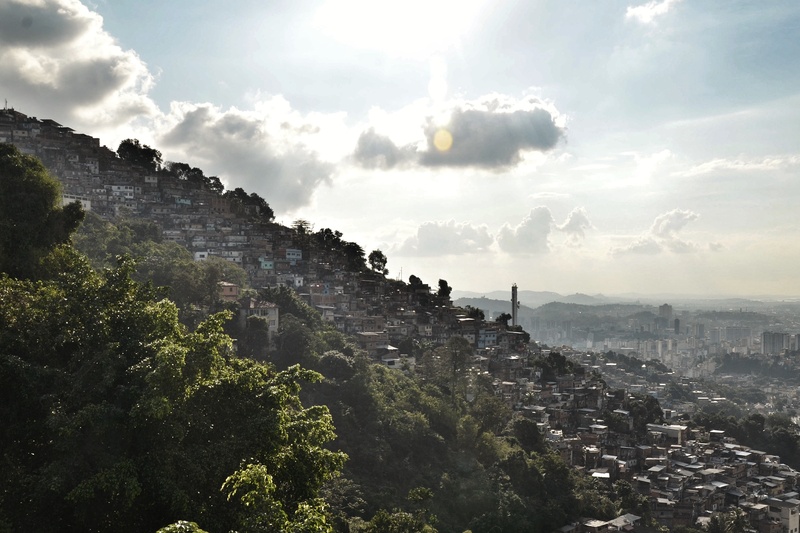 One favela named Mata Machado exists in the Tijuca Forest. It’s inhabitants are mainly the descendants of those who migrated to the region in the 1930s to take part in the replanting effort. Though conditions have improved recently under the Favela-Bairro Project, Mata Machado still contributes to environmental degradation in the forest. 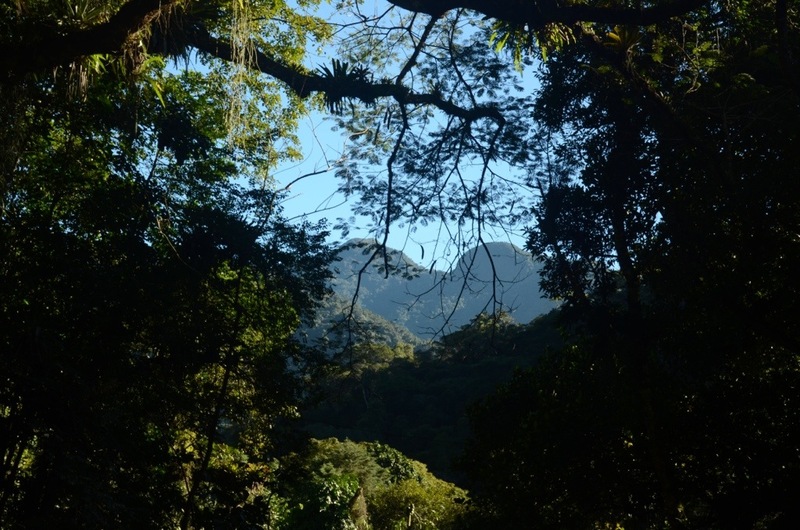 In 1961, Tijuca Forest was declared a National Park. The Forest contains a number of attractions, the most famous being the colossal sculpture of Christ the Redeemer atop Corcovado mountain, Corcovado, meaning “hunchback” in Portuguese. From the peak of Corcovado the panoramic view includes downtown Rio, Sugarloaf Mountain, Copacabana and Ipanema beaches, Estádio do Maracanã (Maracanã Stadium) and several of Rio’s favela’s. Christ the Redeemer (Portuguese: Cristo Redentor) considered the largest Art Deco statue in the world and the 3rd largest statue of Jesus in the world is 30 metres tall, excluding its 8 metres pedestal, and its arms stretch 28 metres wide, and weighing 635 tonnes. 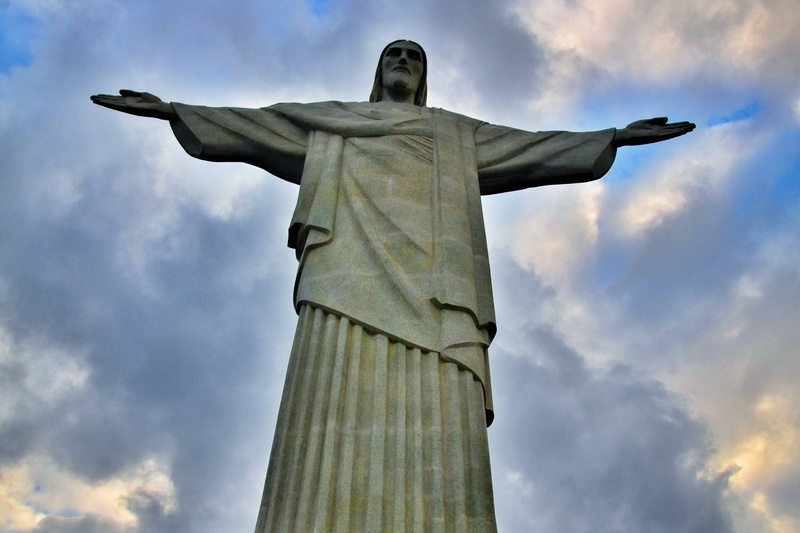 The symbol of Brazilian Christianity, the statue has become an icon for Rio de Janeiro and Brazil around the world, and I am sure we will see this magnificent statue as a backdrop many times during the FIFA 2014 Word Cup next year. Without a doubt, this has to be the home of football! Other than the nature, travel and photography, my other big passion is football, so on our recent trip to Rio de Janeiro we could not miss out on the Maracanã. The Estádio do Maracanã, or the Maracanã Stadium for English speakers, is the main football stadium in Rio de Janeiro, Brazil, and has recently been renovated and re-opened and hosted the FIFA Confederations Cup, but next year will host the FIFA World Cup. The stadium originally opened in 1950 to host the FIFA World Cup for the first time on Brazilian soil. These days the stadium is predominantly used for matches between the four major football clubs in Rio de Janeiro; Botafogo, Flamengo, Fluminense, and Vasco da Gama. But, back to 1950, Brazil progressed to the final round, facing Uruguay in the final match of the tournament on July 16, 1950. Brazil only needed a draw to finish top of the group, but Uruguay won the game 2–1, shocking and silencing the near two-hundred thousand spectators who attended the game. This defeat on home soil is a significant event in Brazilian history, being known popularly as the Maracanazo. The official attendance of the game was 199,854, with the actual attendance estimated to be about 210,000. So a lot of unhappy Brazilian supporters after this shock defeat. A record attendance for any football match. Today the capacity is around the 80,000 level. This of course, in the days before the legendary Pele helped bring the World Cup home to Brazil three times from 1958 to 1970, I think he was a tender 17 years old at the 1958 tournament. 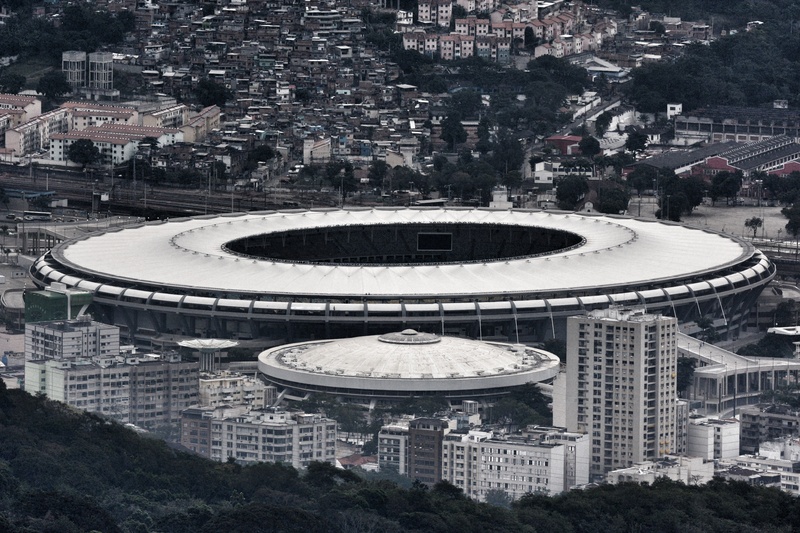 The Maracanã is the same stadium where England mustered a 2-2 draw with Brazil recently, the game being the official re-opening of the revamped stadium for the FIFA 2014 World Cup. The official name of the stadium, Mário Filho, was given in honor of an old Carioca journalist. The stadium’s popular name is derived from the Maracanã River, whose point of origin is in the jungle covered hills to the west, crossing various neighbourhoods of Rio’s North Zone, such as Tijuca The name Maracanã is derived from the indigenous Tupi–Guarani word for a type of parrot which inhabited the region. Can’t seem to get away from the birds in this country, but not complaining! Travel, photography, nature and football all in one trip!